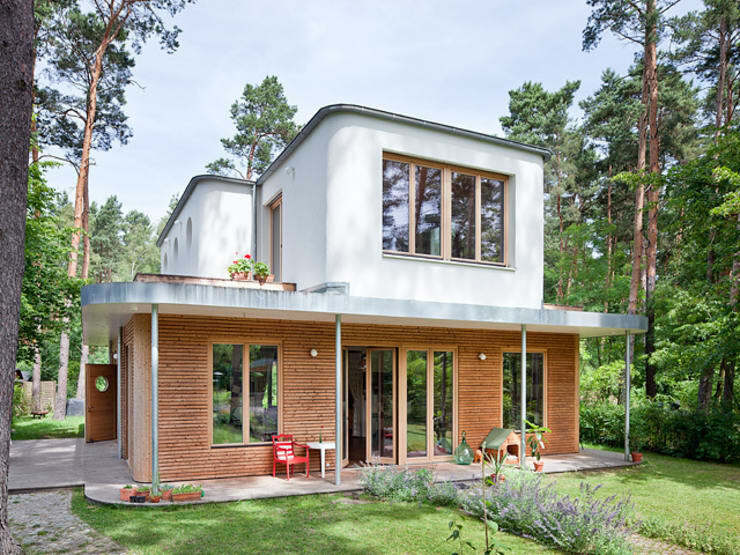 In the small town of Königs Wusterhausen in Northern Germany, architects from Müllers Büro have created a dual-function home that combines art studio space with living space. Not only that, this half-workplace, half-private home strikes a beautiful balance between abstract, manmade design and the natural world that inspires it. In a place where work and play merge seamlessly, this unique home and art studio are a prime environment for a balanced modern lifestyle. 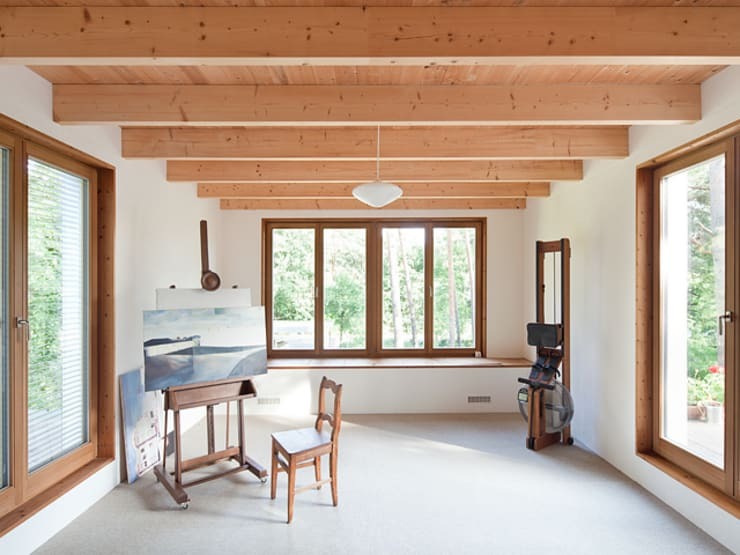 The duality of this home is apparent even in its exterior design, with the lower mass of the home coated in warm wooden planks, and the upper half dressed in a crisp white. 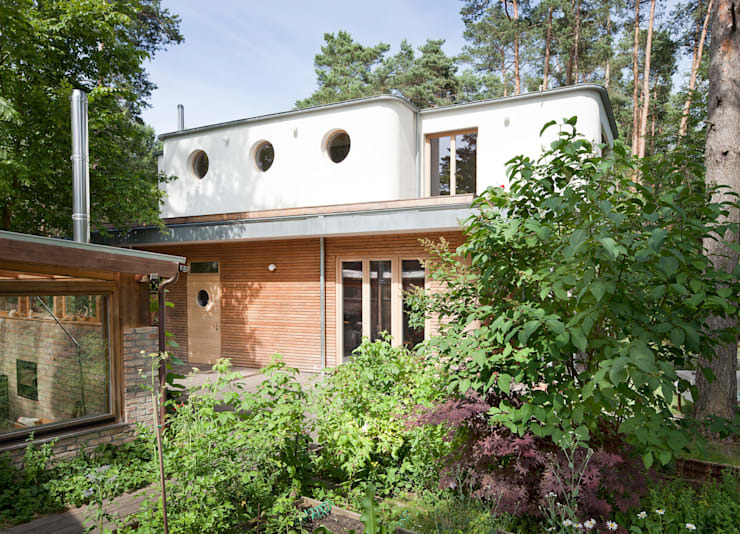 With rounded corners and circular porthole windows, this house's design would be right at home amongst the 1930s south beach or art deco homes typical of California, bringing an almost vacation-like ambience to the place. As an art studio where people of all ages come to relax and unleash their creativity, this upbeat and energetic design is a great way to set the stage. At the front, the home welcomes guests with a door intended for public use; along the side, the family enjoys a private door for home access. 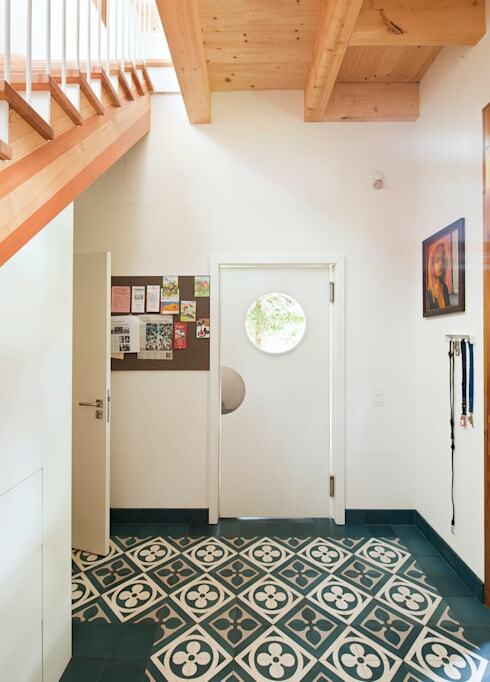 Upon entering through the swinging door, guests are immediately greeted with a playful patterned tile, already setting a stage for the creative atmosphere this studio is meant to instill. You love the flooring? Find more inspiration here. The ground floor offers a large, open area where people can gather and create. Well equipped with floor-to-ceiling cubby shelves, tables on wheels, and lightweight furniture, this room offers both convenient permanent storage as well as highly mobile furniture allowing for day-to-day flexibility. Bathed in natural light and benefitting from several industrial hanging light fixtures, this studio space ensures that there's always plenty of light for all the creatives who work in this studio. Leading away from the more public meeting area, you enter a quieter retreat, designed as a painting studio. 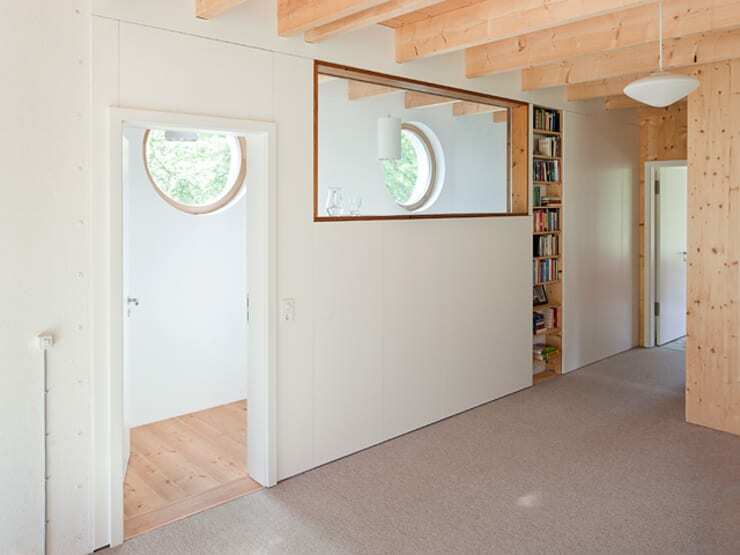 Simpler than the busy gathering space, this studio offers clean white walls with plenty of windows – and not much else. With a mobile easel and chair on wheels, the artist can move to attain the best possible lighting, shifting their angle as the day goes on. Providing a degree of separation between work and play, this side entrance is intended for family use, leading through a small foyer into the living room. 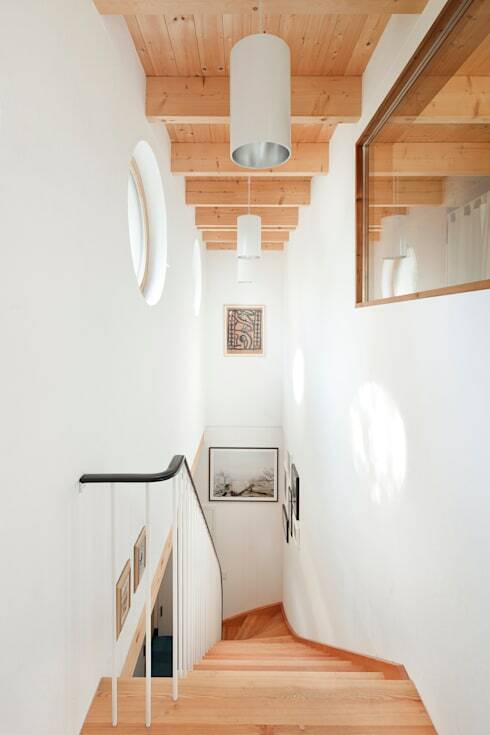 While the home serves two functions, you'll notice that the design elements have remained the same throughout both spaces – the private home area also employs the same exposed beam wooden ceilings, as well as nautically-inspired elements like the circular porthole windows. 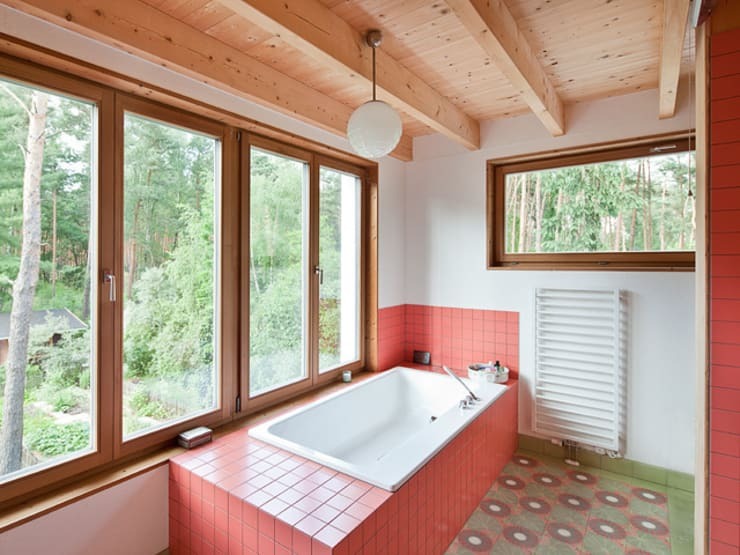 In a classic 1930s modernist style, this bathtub bathes in a rosy array of square tiles, enjoying a lovely vantage point made possible by the absence of next door neighbors. Carrying on the playful tiled theme from the front entrance, this bathroom floor is decked out in an art deco-inspired tile, whose geometric shapes emphasize the creative and upbeat nature of the home's overall design. Unlike the cramped and hidden spaces that often house the stairs, this well-lit and visually dynamic staircase draws attention to various point of interest through out the high hallway space. At the top, cylindrical lamps and circular windows illuminate the ceiling, while an interior-facing window and abstract picture fill in the wide white empty space above. With a slick black railing smoothly connecting the upper and lower floors, this staircase offers a contemplative and visually dynamic climb for these artists! It looks like paper isn't the only canvas these artists use – their backyard has been converted into a lovely elevated garden, with container boxes holding plants of various heights and colours within their wooden plank walls. A separate structure (with the silver chimney) offers an additional degree of intimacy and escape, housing a detached living room and bedroom within its solid stone walls. To tour another creative home/art studio space, check out this one-of-a-kind artist's home filled with energetic surprises! 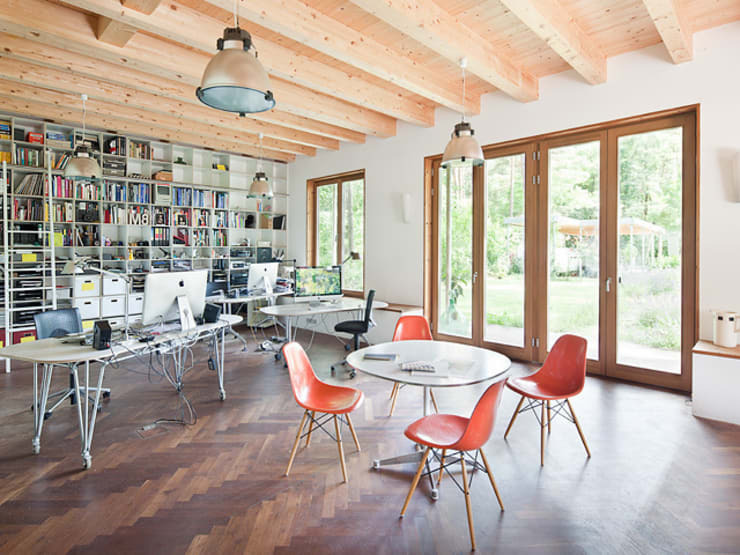 What do you think of this dual function home and art studio? Comment below!